The de-Nazification of one other iconic car brand of the 1930s proved more difficult. There is nothing cute and cuddly about a Mercedes. Maybe furthest removed from the aggressively futuristic and necrophiliac aesthetics of the 1930s is the 300 SEL 6.3 of 1972, sealing the Wirtschaftswunder in gold-metallic and an obvious attempt to look more like a fast-moving piece of expensive furniture rather than a bullet. 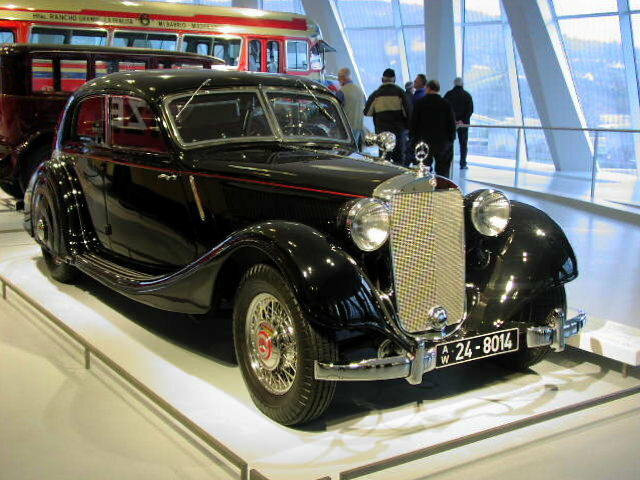 There never has been a more civilian Mercedes than that – and still it carries some material memory of the first Mercedes designed to travel down the Autobahn, the Stromlinien-Limousine, of which theMercedes Benz Museum displays the 320 version of 1939. Seeing it my first thought was “evil on wheels” – picturing some regime types in matching black uniforms travelling on Party business. The presentation, however, entirely plays to the visitor’s fascination with technology and automotive beauty – arguably it is one of the slickest cars of the whole exhibition. To be fair, the Mercedes Benz Museum doescontextualise its cars historically and there is no attempt to gloss over the significance of the Mercedes car in the iconography of the Third Reich and the involvement of the corporation in its crimes. But it is intriguing to see how the visitors’ appreciation is completely absorbed by the technological detail and the seamless aesthetic even where the link to Nazism is clearly stated, as with the 770 of 1937 which is marked out as a preferred vehicle of industrialists (such as the original owner of this one – Otto Wolff von Amerongen) and key figures in the Party hierarchy (although they don’t point out that this includes the key figure). The Stromlinien Limousine itself, however, is taken out of context and included in a collection called “Voyagers” – the Autobahn for which it was designed as a fast and safe traveller is not linked to the regime. The name itself is telling. The seamlessness, that in theDS is deployed to create a republican/domestic road goddess, here is foregrounded as technologically justified by aerodynamics (Stromlinenform as aearodynamic or streamline shape) but also alludes to the concept of the Linie, the Party line to which the member of the national community is to be true, linientreu. The purity and cleanliness that its shining and unbroken surface suggests makes the same point: it is sauber andrein, common slang for … linientreu. So the Stromlinie, line of flow, moves two ways – against the stream of air against, cutting through its resistance as the purportedly unstoppable movement cuts through the forces opposing its progress; and the streamline of that movement itself into which all its constituent elements have to fit without any remnant of individuality. In shining funeral-black, the radiant non-colour of the mythical Black Sun by which SS leader Heinrich Himmler was fascinated accompanied only by a few lines and circles of the most aggressive shade of blood-red and the unavoidable steely chrome that in combination here mirrors the dress sword. As design masterpiece it encapsulates the fascist aesthetic of terror whose attractions live on in the notoriously recurring instances of “Nazi chic” in popular culture. But as (among other things) totalisation of the necrophiliac tendencies of industrial capitalism is a constituent element of Nazism this fascist imagery of speed and death remains an undercurrent in the general kinetico-aesthetics of automobility as long as industrial capitalism retains some dominance. The eerie technocratic coldness of Kraftwerk’s 1974 hymn to the driving on the Autobahn – a piece tailored, probably, more to the experience of driving the above-mentioned 320 SEL through 70s Bundesrepublik monotony – in its anti-humanist machinality nonetheless also highlights the link between that car and its totalitarian ancestor which still seems to travel as a ghost down the fast lanes. Particularly as subsequent streamliners (such as the latest S 300 BlueTec) seem to be aiming for a halfway position between the emphatically civilian 320 SEL and the fascist 320 Stromlinie. There is a long distance between the two, but it is a distance on a continuum.